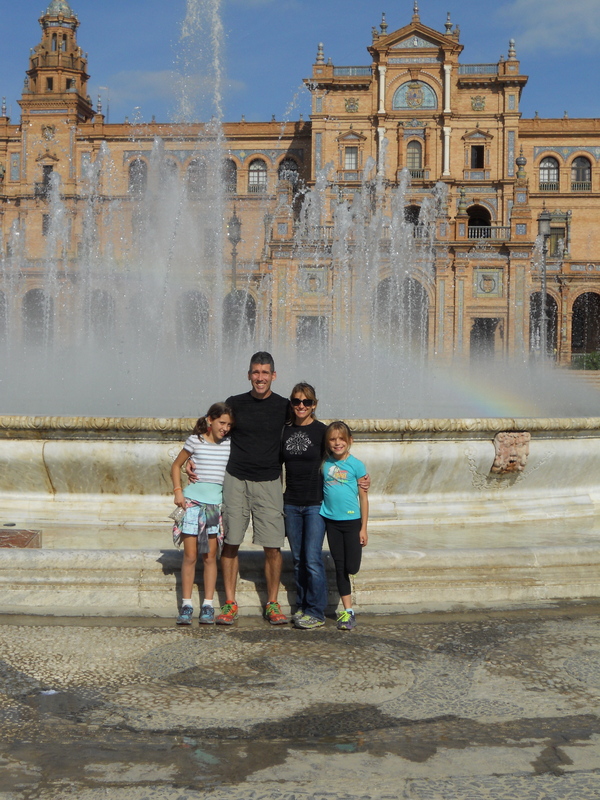 This weekend we made our first out of town excursion to Sevilla. 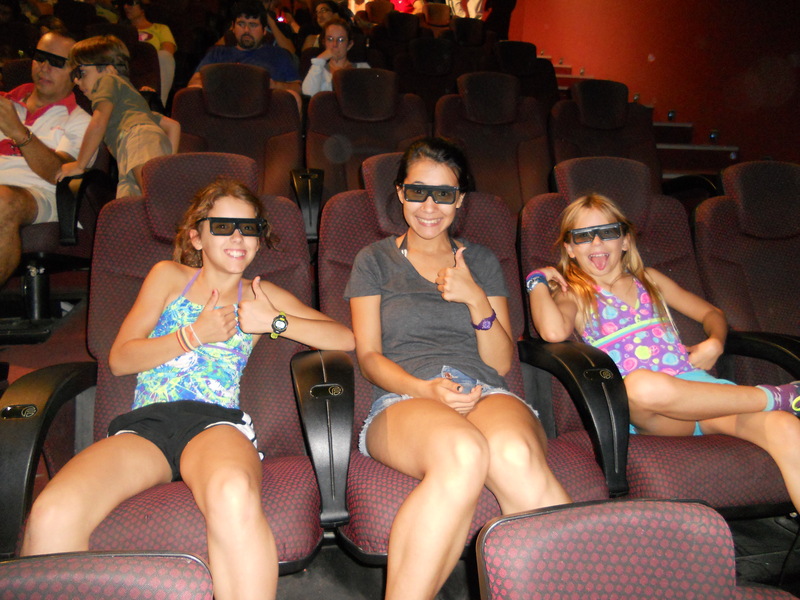 The girls came home from school on Friday at 2:00 PM. We had a quick lunch and piled into the car with our overnight bags, cameras and backpacks. 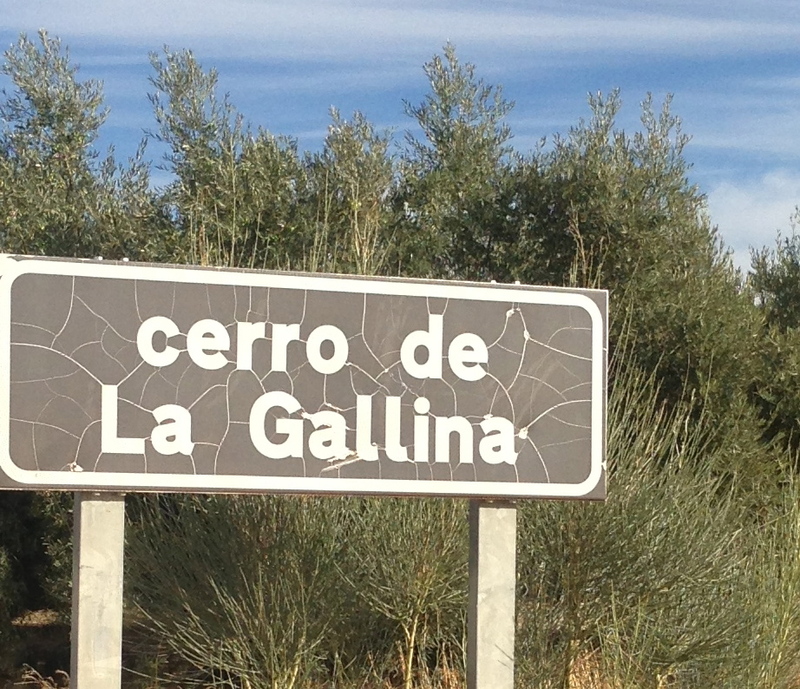 Sevilla is 200 km from Alhama. As we drove west the rolling hills gave way to a flat plain. We played a game translating the names of the towns and signs we passed using the Babylon app on my iphone. We passed Cerro de la Gallina (“Chicken Hill”), Moron (“small hillock”), Cuesta Blanca (“White ridge with a steep slope on one side and a gradual slope on the other” sounds like a hill to me) and Cuesta de la Palma (Ridge with a steep slope… of the grove of palms). Are you noticing a theme here? There are so many ways to say hill in this language! I typed hill into the translator and it gave me ten words that are different types of hills: cerro, lomo, colina, alcor, altillo, altozono, collado, cuesta, monte, riba, moron… It was obviously very important when Spanish was developing to properly describe a hill because each of these words means something slightly different but basically they are all hills. 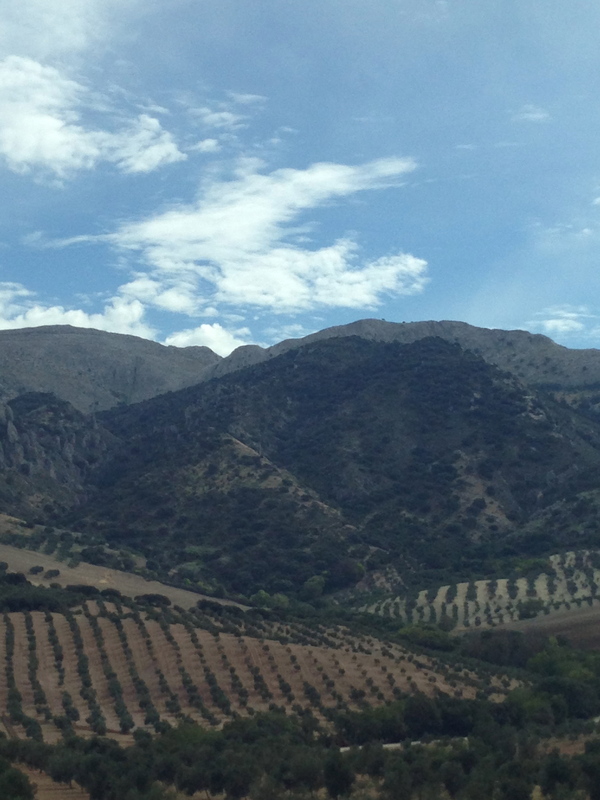 When we arrived at Llanos de Antequera (“large flat area of grassland where few trees grow of Antequera) we knew that we were out of the hills! The flat plain was reminiscent of the Central Valley in California. Driving on the A92 toward Sevilla looks so much like California’s I-5. 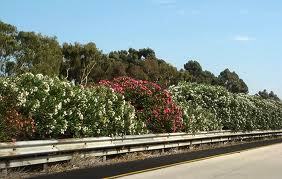 It is even complete with the Oleander flowers in the median. I was trying to find out how to spell Oleander and Mike came across an interesting post on Flickr. Robert Couse-Baker claims that the Oleander was once incorrectly thought to have been imported from the Mediterranean regions of Iberia (Spain) and Northern Africa. However, it was actually found much earlier in North America by the first nation peoples who arrived and found meandering lines of Oleander. It was called in various dialects “that useless plant that goes in long pointless lines to nowhere”. Out of some perverse curiosity people followed these long lines of plants leaving trails in the soil. These trails would later become trade routes and over time, they were overlaid by European settler roads and eventually the state highways we know today. Not likely true, but funny just the same. 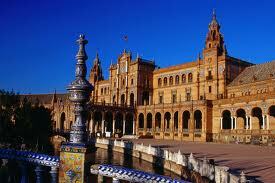 Sevilla is the capital of Andalucia and the 4th largest city in Spain with 1.5 million people in the metropolitan area. 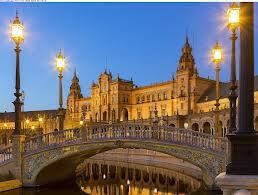 According to myth Sevilla was founded 3000 years ago by the Greek God Hercules. 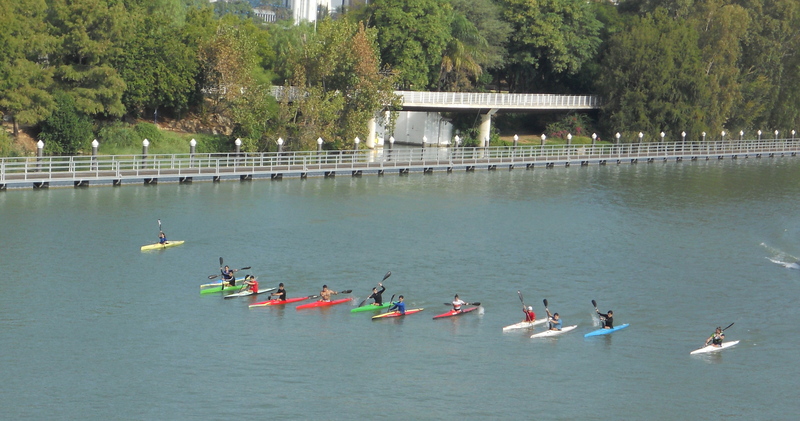 The Rio Guadalquivir runs through the city. 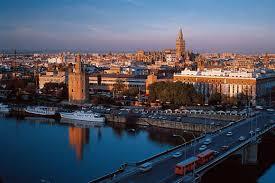 Sevilla Harbour is 50 miles from the Atlantic Ocean, and it is the only river port in Spain. It was the most important trading port between Spain and the new world after Columbus discovered the Americas in 1492. 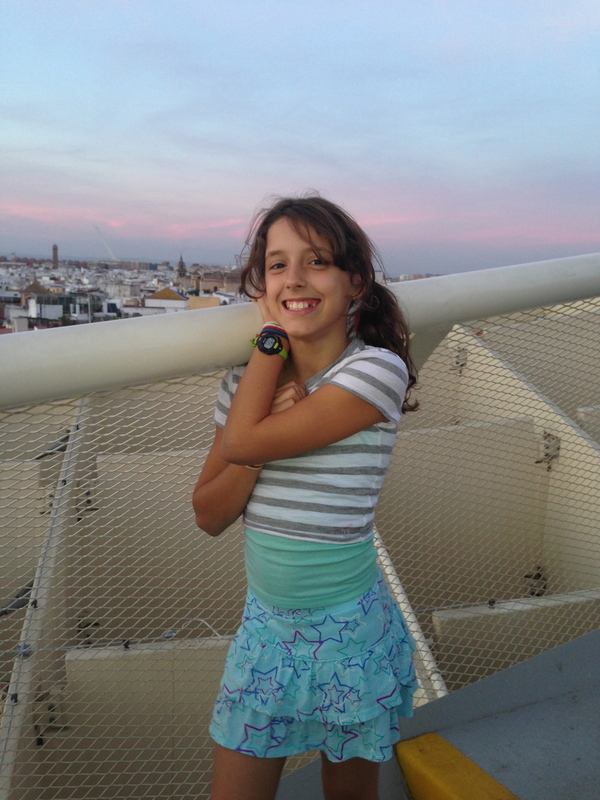 Back to the adventures…We arrived in Sevilla before dark. We checked into the Hotel Barcelo which is really quite nice. 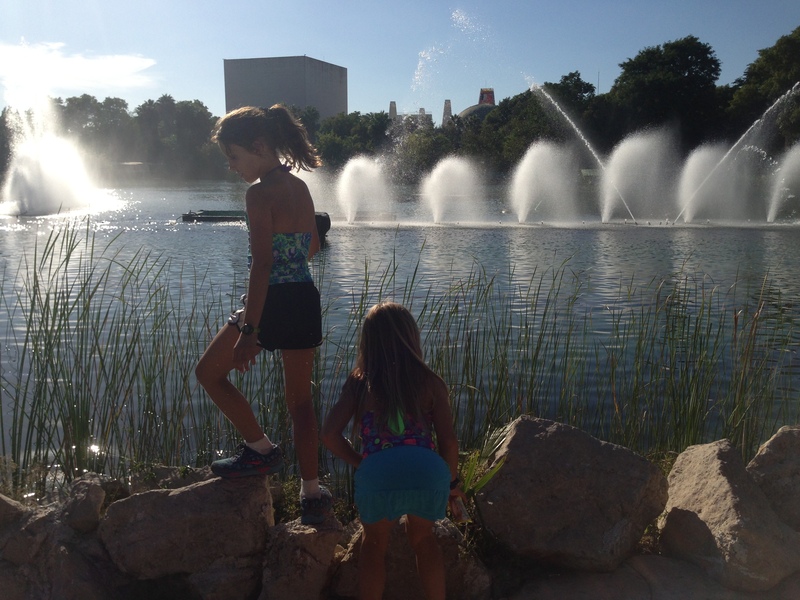 The kids had a great time running around and exploring. There was a pool so they changed into their swimsuits. When we got to the pool it was nearly empty but the girls were enthusiastic to swim. They jumped in and jumped out, very cold. 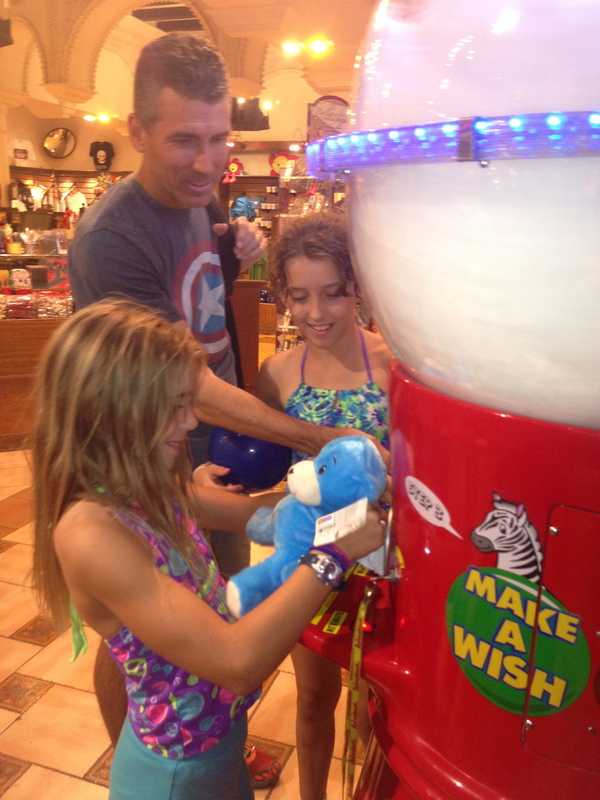 We wrapped them in huge, fluffy blue towels and took the elevator back to the room. They played in the warm bathtub together to make up for not getting to swim much. 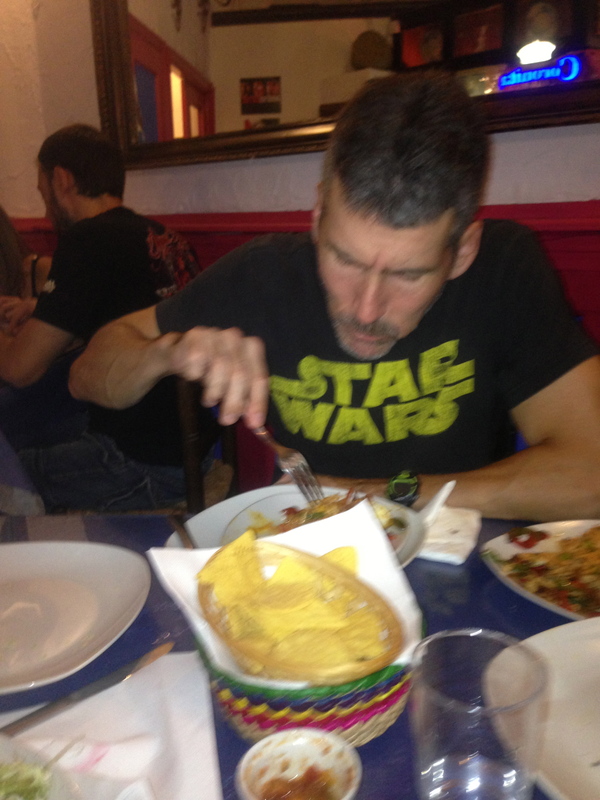 I consulted trip advisor and found a genuine Mexican restaurant that was highly recommended. There had been a considerable amount of homesickness and we were wishing for some good black beans so real Mexican food was just what we needed. The restaurant was difficult to find but very worth it. We were greeted by the owner, Oscar, who is a young man from Oaxaca, Mexico. 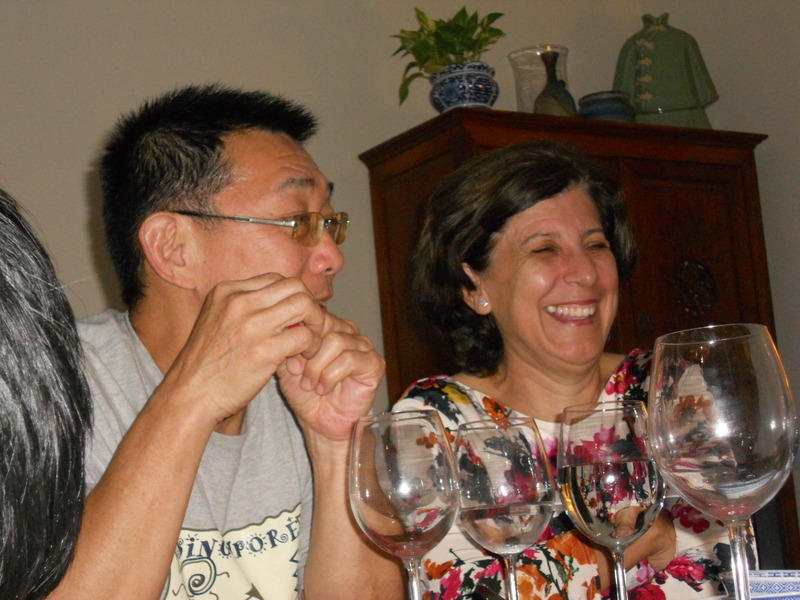 He came to Sevilla 3 years ago for cooking school to learn to cook Al Andaluz. Ironically, he stayed and opened La Cantina Mexicana and taught the Spanish to cook Oaxaca style. We drank Coronas and ate empanadas de verduras, fajitas and savored every bite of his wonderful refried black beans. Mike’s tradition is to ask the waiter for their favorite thing on the menu. Oscar brought him a dish called El Gringo. He said it was his favorite but I wasn’t sure if he was making fun of us. Either way, Mike declared it delicious and ordered a second one. We asked Oscar where he gets his beans. Imported from Texas, of course! The best beans in Spain! In Spain it is illegal to smoke inside any public place so we always choose to sit inside if we can. It is still legal to smoke in an outdoor cafe but most smokers stand in the doorway so they can talk to their friends inside- not cool. We already liked Oscar but when some cigarette smoke wafted by our table he smelled it too and scurried to the door to close it. Ahh, a man after our own hearts! On Saturday we walked from the hotel to El Centro. 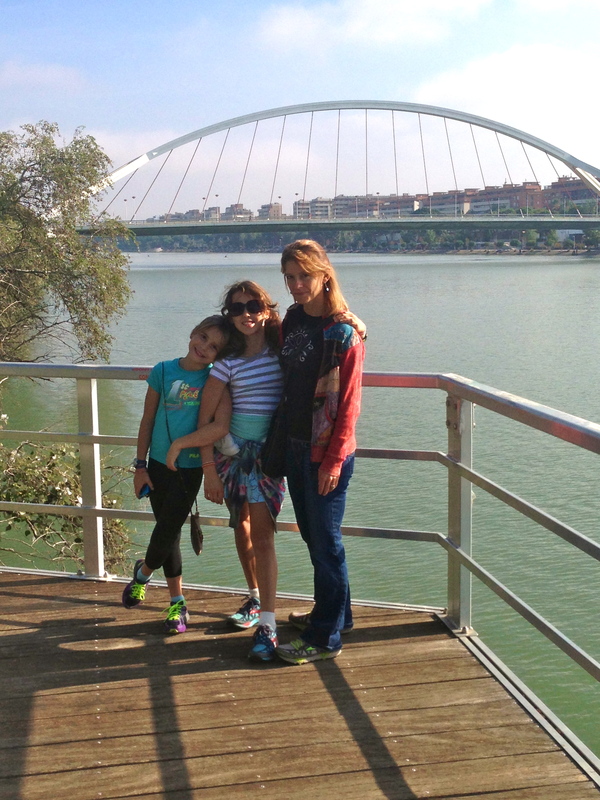 We walked along the Rio Guadalquivir on a bike path. The path and the gardens along the water were all part of the renovations for the 1992 World Expo. In 1992 Sevilla also celebrated the 500th anniversary of Columbus’ famous voyage. 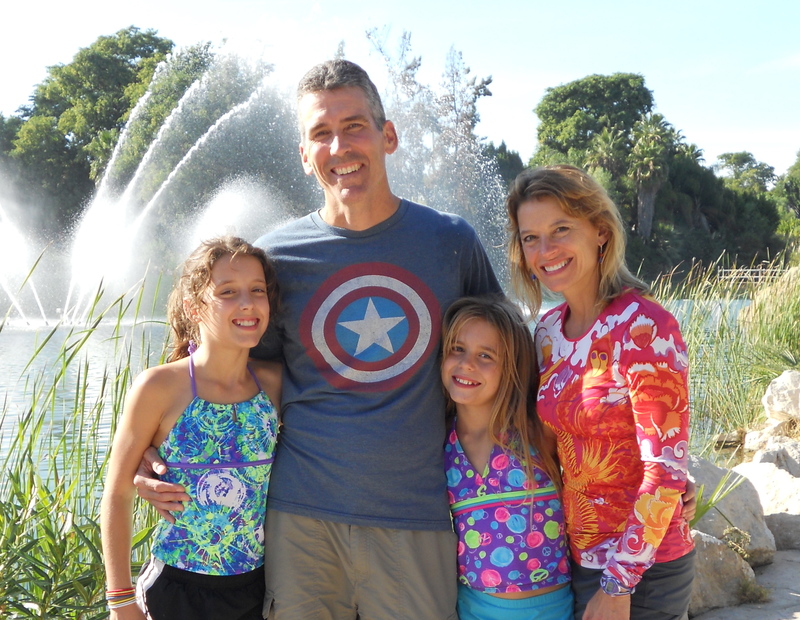 There were lovely fountains, gardens and pools of water that must have been spectacular at one time. The area has been sadly neglected in recent times. 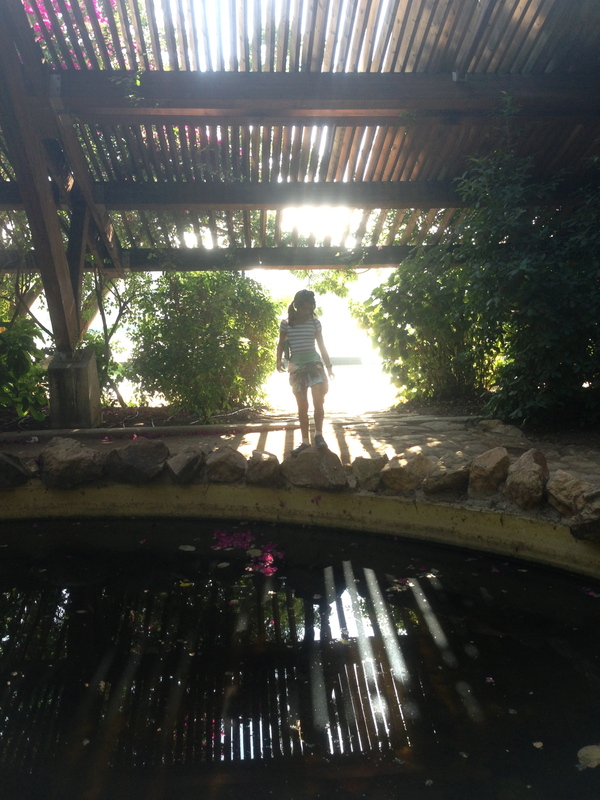 The pools had murky water with small koi fish gasping for air. The fountains were not working and the flowers were crowded with weeds, but one could still feel the magic of the past in this place. 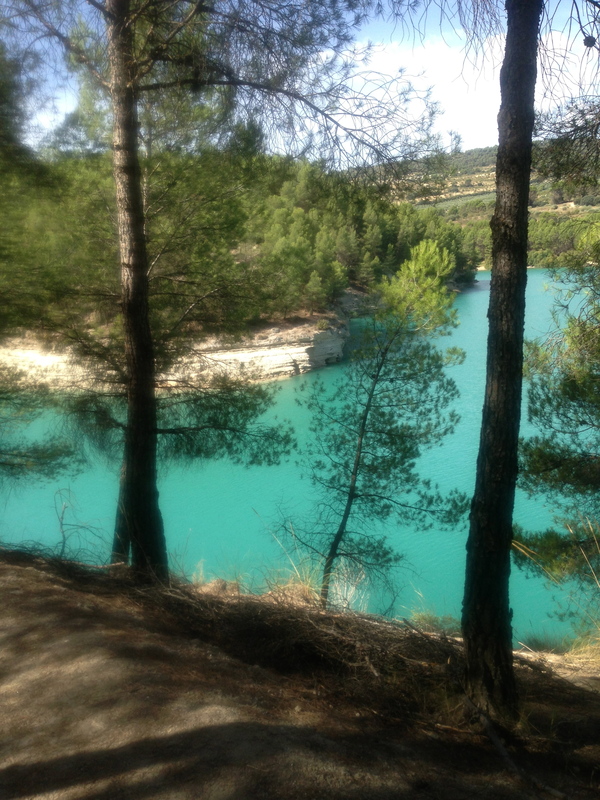 We crossed La Puente de la Cartuja admiring the long, colorful lines of kayakers out for their morning exercise. By the time we made it to the center of town everyone was exhausted. We stopped at the first Starbucks we had seen in 3 months. We ordered our favorite drinks and sunk into familiar chairs for a rest. 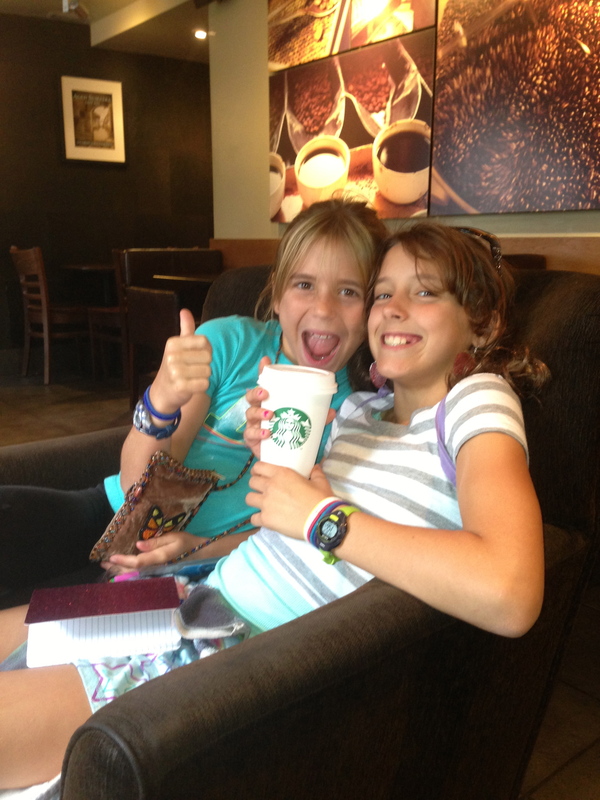 Team Kezmoh at Starbucks in Sevilla! We watched the parade of tourists on the street and played “guess where they are from”. 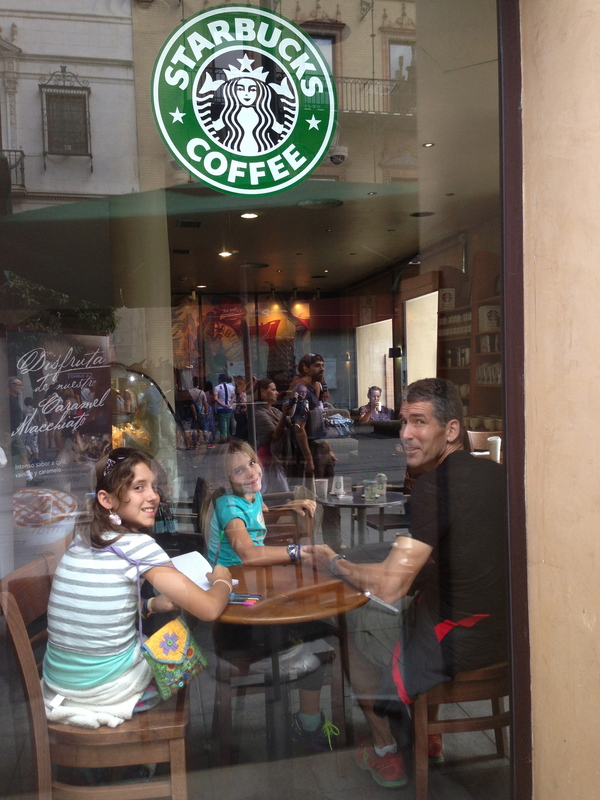 From Starbucks we walked past La Catedral de Santa Maria, officially the largest cathedral in the world by volume. It is 3rd by actual size after St. Paul’s at the Vatican and St. John’s in London. There was a fancy wedding and we admired the brightly festooned guests who stood on the stairs. Past the cathedral a line of horse drawn carriages stood, their drivers lazily glanced down at us as we approached. 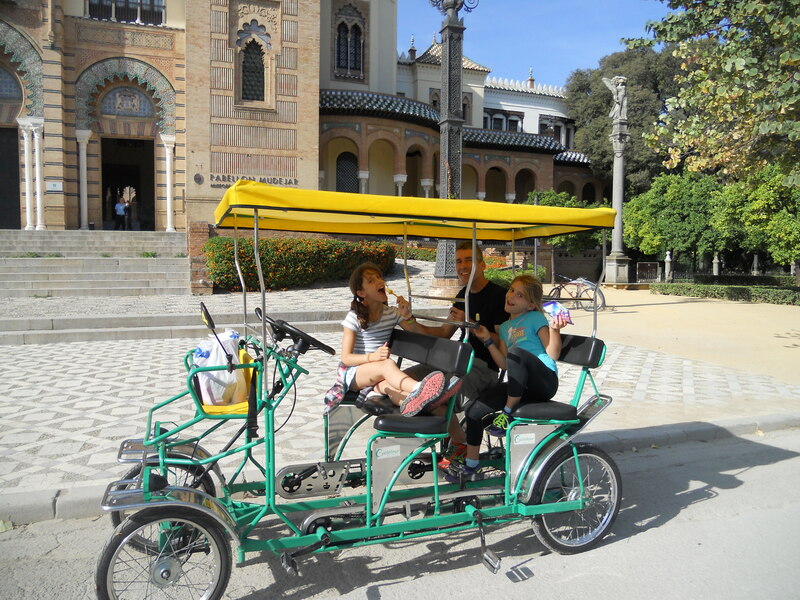 When I was a student in Spain I romantically imagined returning with my children who would beg to go for a ride. Sky pretended to be interested but as it turned out I was really the only one interested in a carriage ride. No one else really cared about the carriage ride but agreed to indulge me. 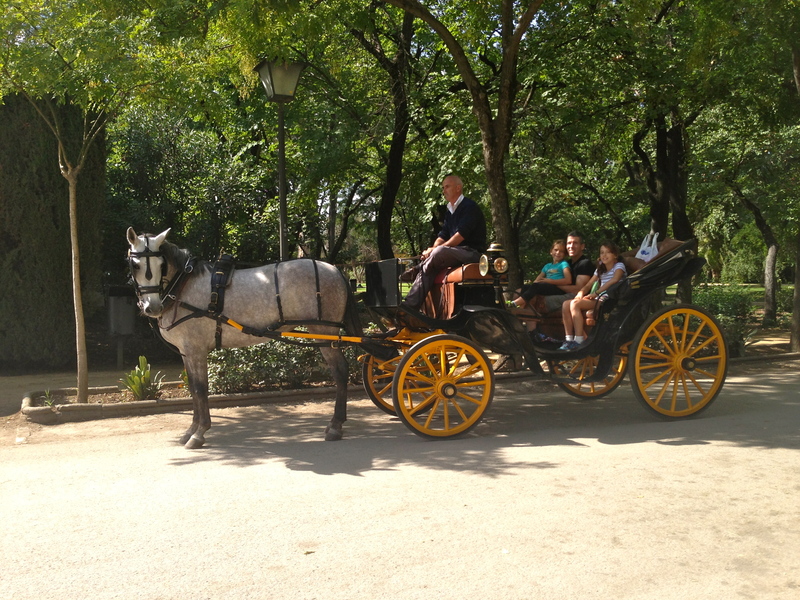 The carriage sped down the busy streets with the cars. We glimpsed monuments going by. 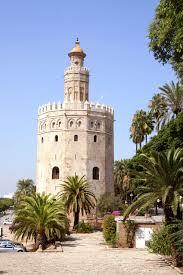 We passed the Torre del Oro one of the most recognizable features in Sevilla. It is a 13th century Almohad watchtower by the river. In the distant past it was covered in golden tiles and was once used to store the treasures brought back from the Americas. Even then it was more than 500 years old! Hard for me to imagine coming from a country who only just celebrated it’s bicentennial during my lifetime. Today there is a small museum inside. We also passed the Antigua Fabrica de Tabacos an enormous building which is now the Universidad de Sevilla. 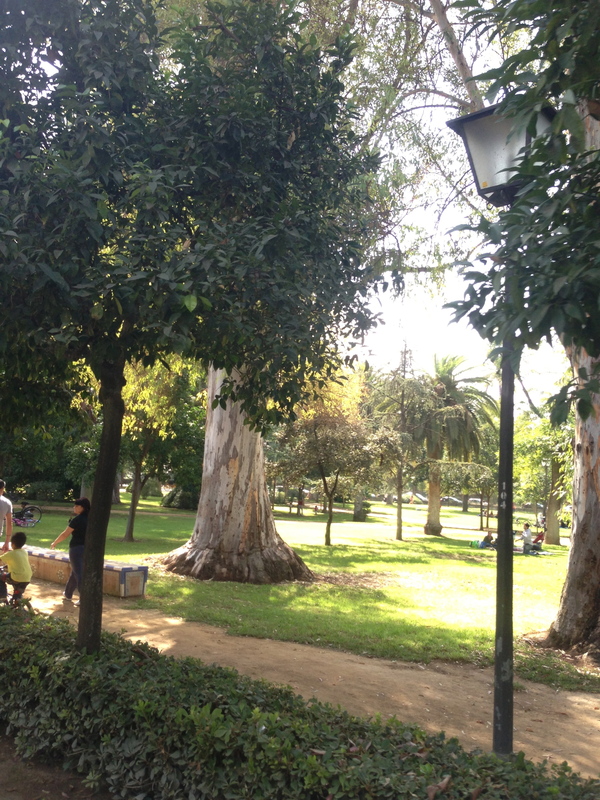 Our tour ended in the Parque Maria Luisa where I once spent many hours running and sitting in the shade of the enormous elms and Mediterranean pine trees. 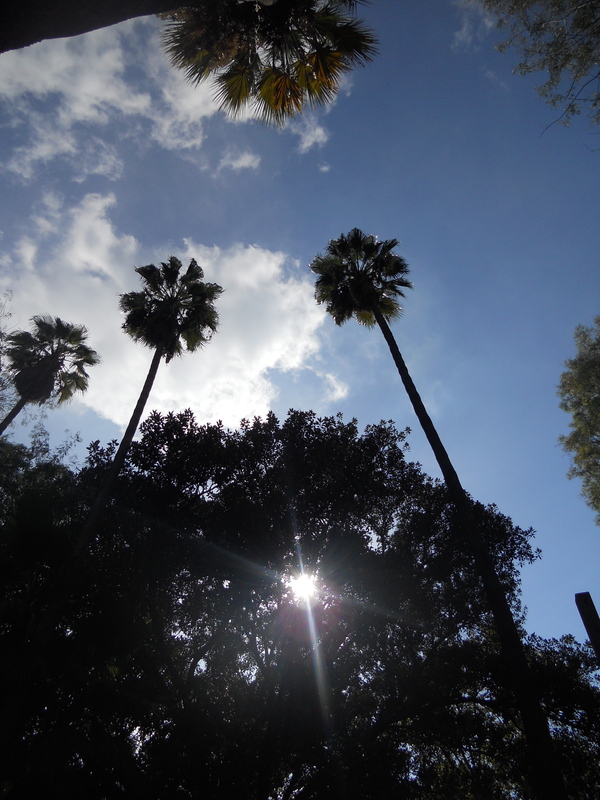 Sunny day in Sevilla! Not really any other kind! 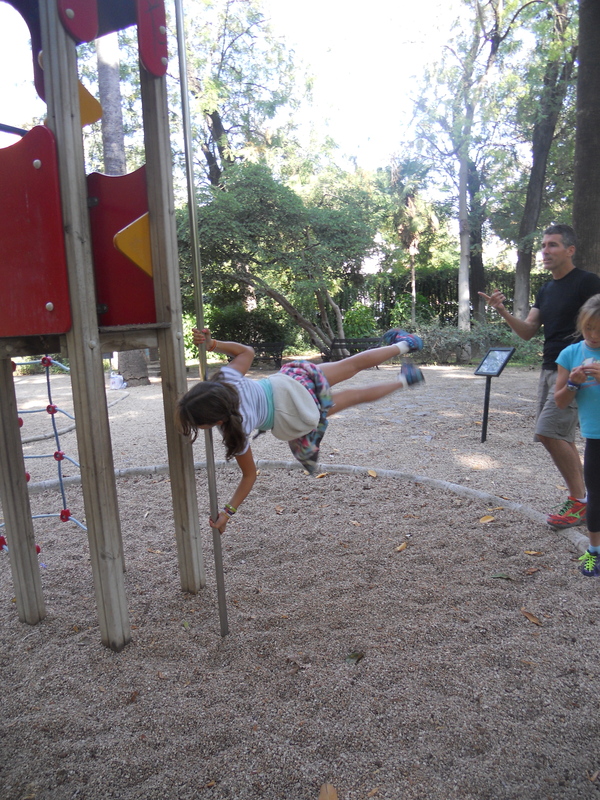 There were beautiful canopies of trees, brilliant flowers, fountains and Sky and Savannah’s favorite – playstructures! 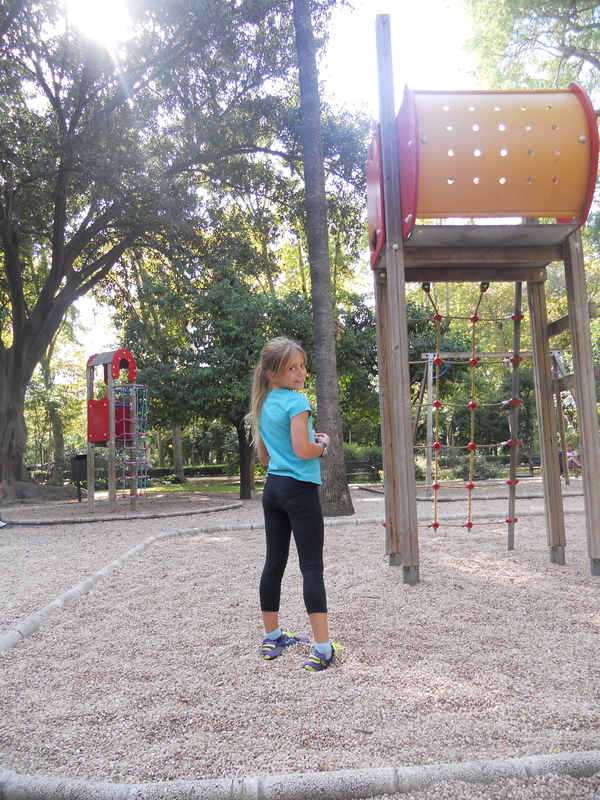 Parks are the best no matter where you are in the world! 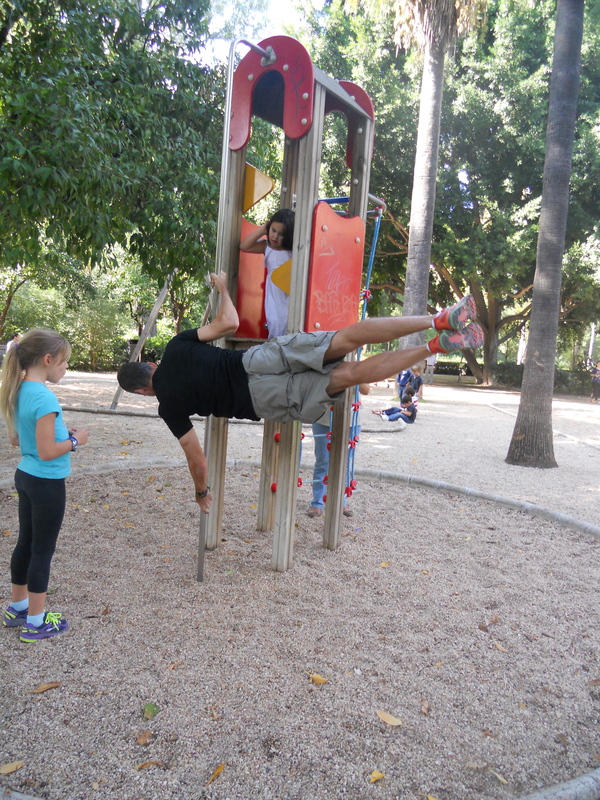 The park dates back to the mid 1800’s but luckily the play structures are most certainly from this century. 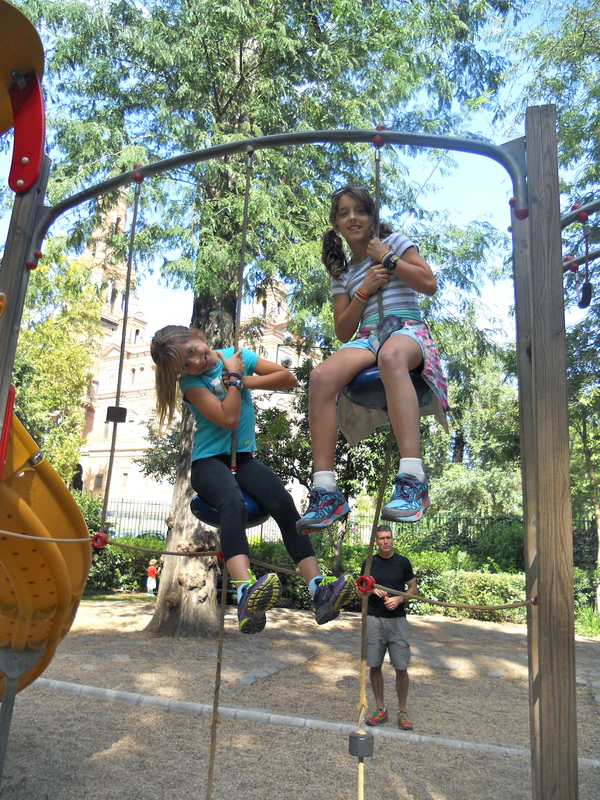 The park originally was the garden of the Palace of San Telmo. Princess Maria Luisa Fernanda left the gardens to the city of Sevilla when she died in 1897. 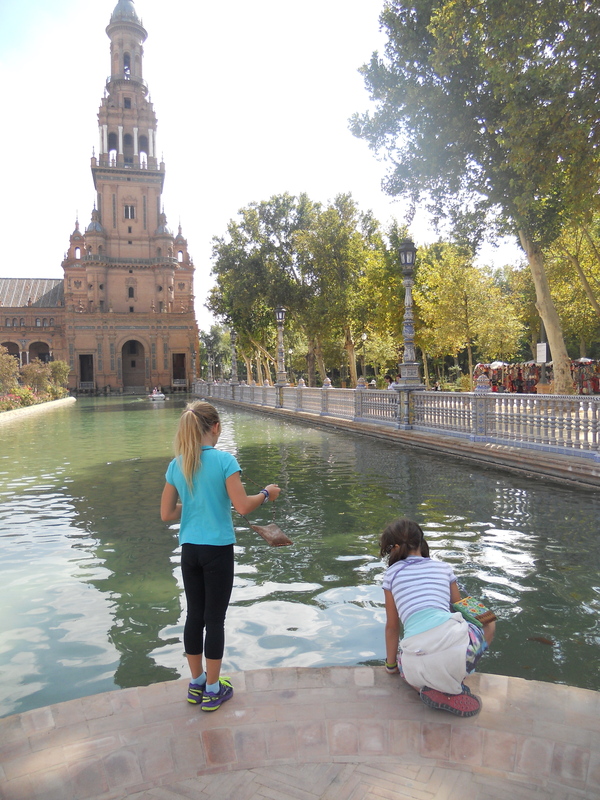 Inside the park is The Plaza de Espana, my favorite site in Sevilla. It was built in 1929 for the Exposicion Iberoamerica. It features beautiful Sevillana tiles. There are tiles with maps and historical scenes for each Spanish province. A canal runs the length of the building and for 5 Euros you can rent a little boat to row in the moat. In the center there is a huge fountain where we posed for some photos. We visited Sevilla on the Dia de la Raza (Columbus Day), a Spanish national holiday, so the plaza was significantly more crowded than usual. There was a contest going on in the plaza for the best tasting jamon. Participants and judges tasted the entered pig legs and voted for the most flavorful. We were there as they announced the winners of the best HAM in Andalucia. Have I mentioned the Spanish obsession with jamon in the past? 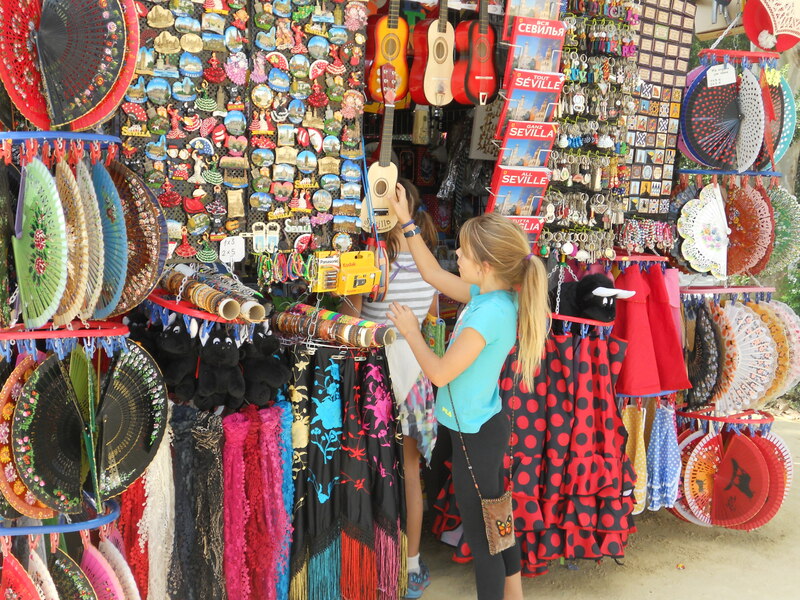 Vendors lined up in front of the Plaza de Espana selling brightly colored scarves, dresses, fans and magnets. We bought fresh roasted chestnuts, which we peeled and ate. They tasted similar to potatoes. Carolina, our friend/Au Pair who stayed with us in California this summer met us in the park just in time for a ride on a cool family bike. 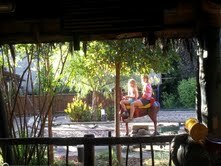 We rode around under a canopy of green trees and Caro pointed out her favorite spots to play as a child. 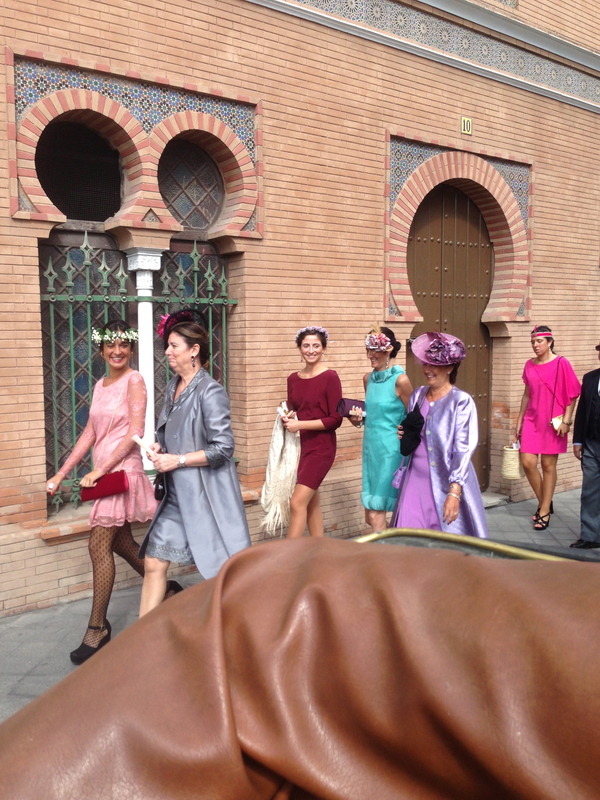 Our next stop was the Festival de las Naciones which is celebrated for a month in Sevilla. 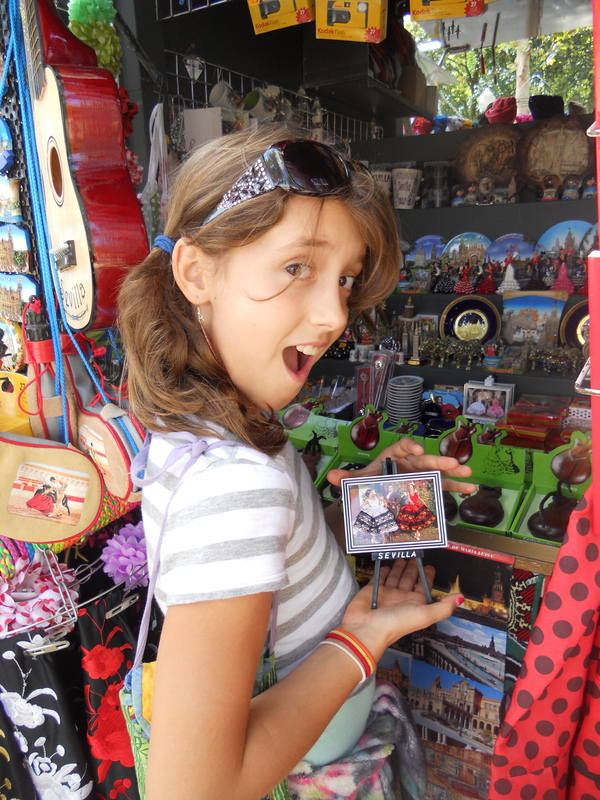 There were vendors selling everything from olives, hacky sac balls to wooden flutes (we bought each of these items! ). There were food stands representing France, India, Mexico, South Africa, the US and many more. 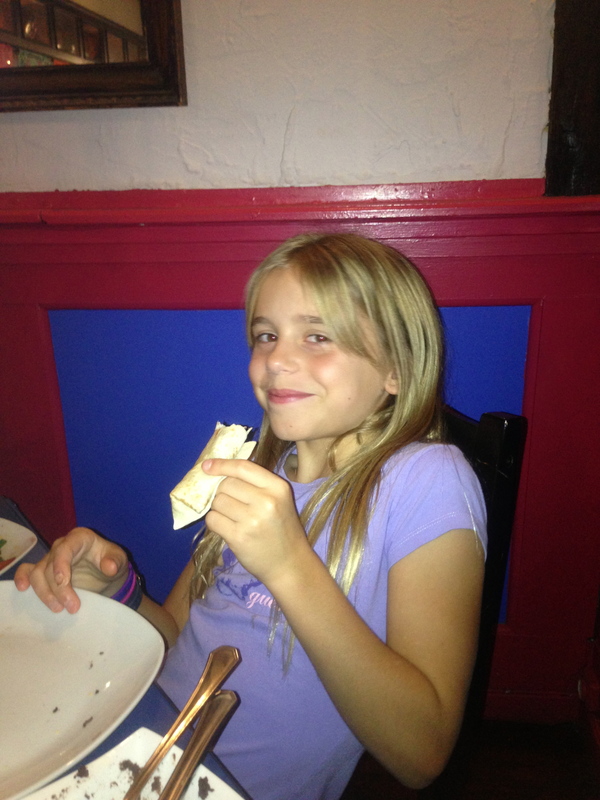 Sky chose a vegetarian samosa from India. She announced that it was good but not as good as Ishani’s mom’s samosas! Mike, Savvy and I ate in Mexico and drank wine from France. 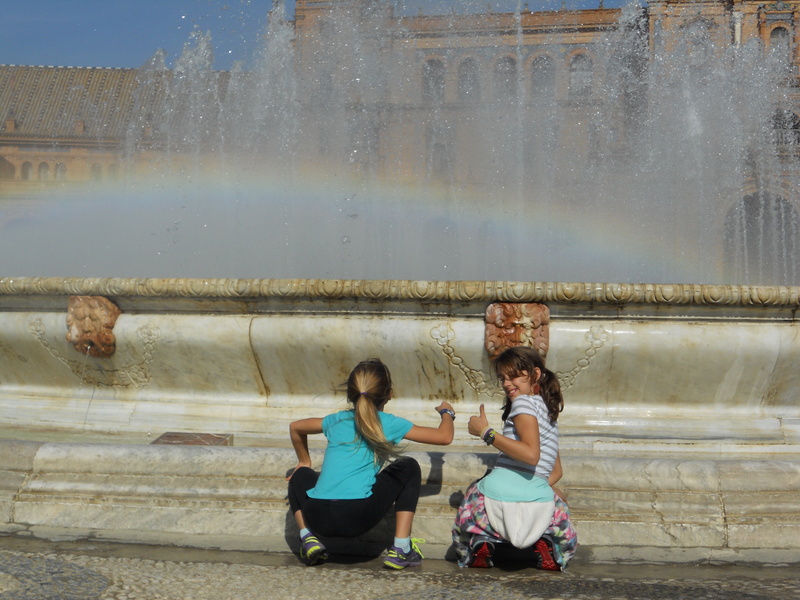 The girls noticed that all around Sevilla there is the symbol NO8DO. It is like a hidden Mickey in Disney World. If you don’t know to look for them you might miss them, but when we started paying attention the symbol was everywhere. 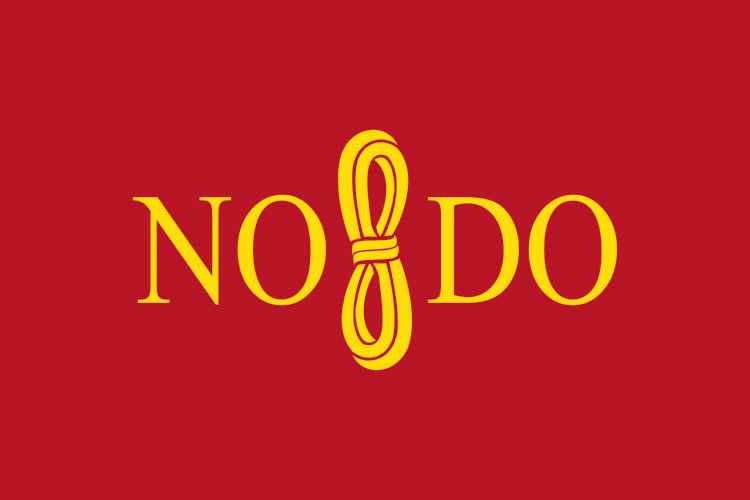 “NO8DO” is the official motto of Sevilla. It is even on the flag. 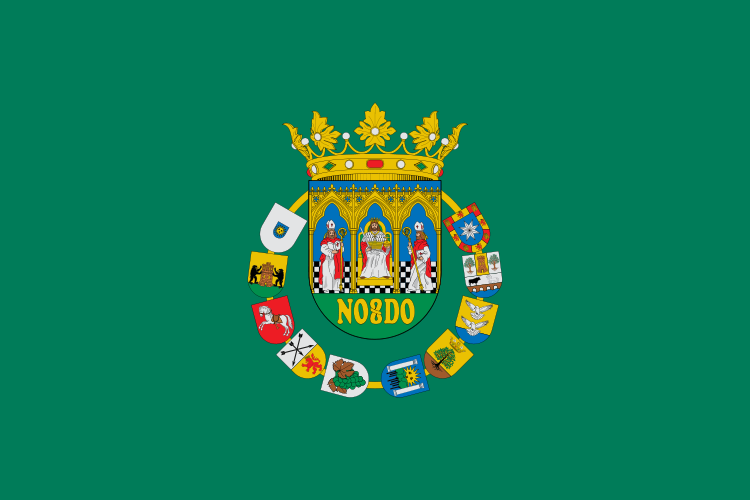 It is popularly believed to be a rebus signifying “No me ha dejado”. The 8 in the middle is supposed to be a loop of wool, a “madeja”. Literally the meaning is: “Sevilla has not abandoned me”. However the feeling is that Sevilla is a city that will always stay with you. 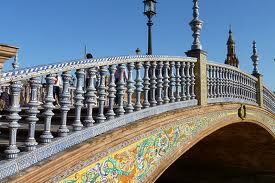 Sevilla is a magical place and it is true that once one spends some time there it will stay with you always. 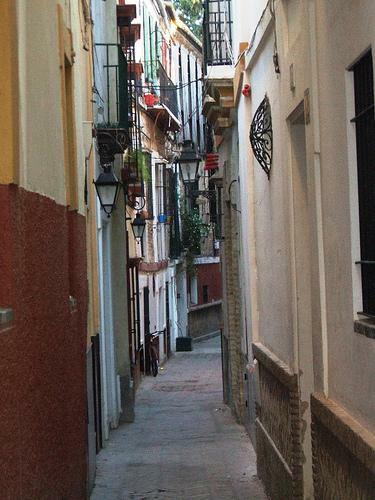 We made our way through the tangle of winding streets in the Barrio Santa Cruz. 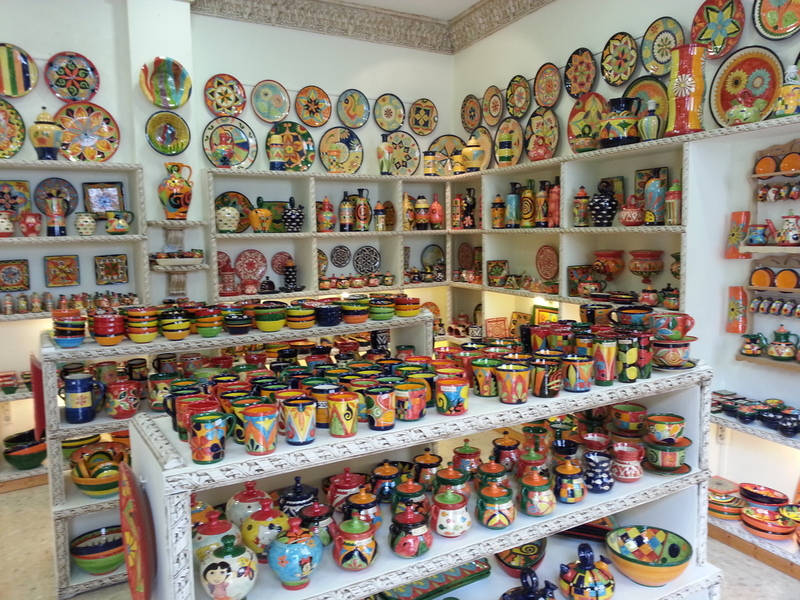 We admired the beautiful tiles and I stopped to buy pottery in a store so colorful I could live there. 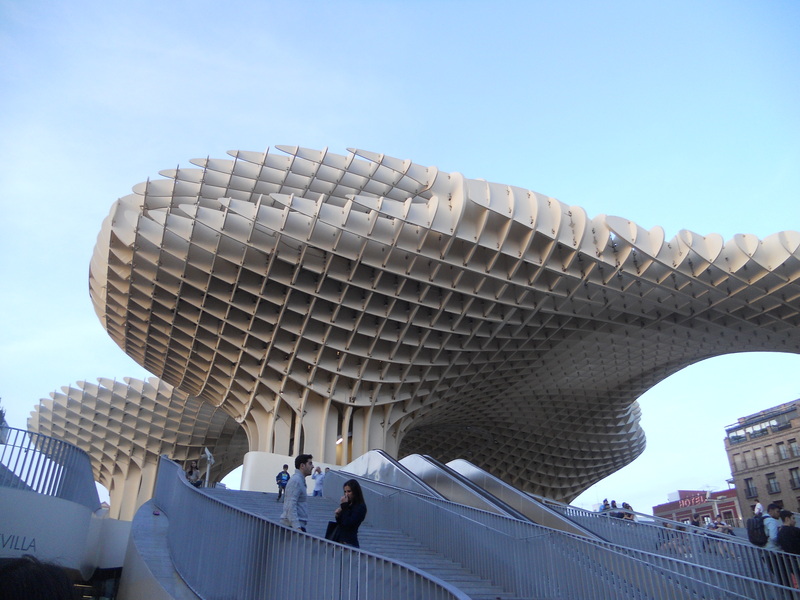 We emerged from the narrow streets at Sevilla’s newest attraction, The Metropol Parasol. It was opened in 2011 and was built by German architect Jurgen Mayer-Hermann. It looks a bit like a honeycomb or a flying waffle. It is in the Plaza de la Encarnacion and the Sevillanos think it looks like mushrooms, thus the local nickname “Las Setas de la Encarnacion” (The mushrooms of the Encarnacion). 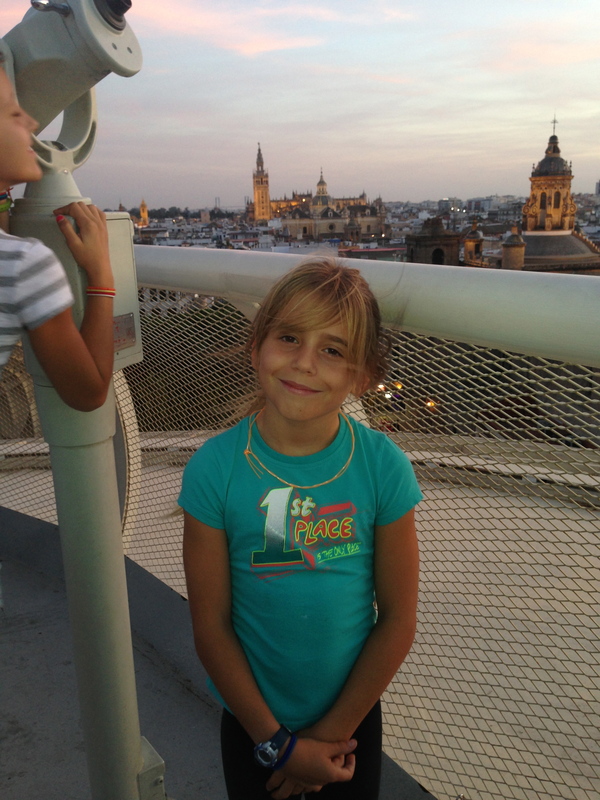 We took the elevator to the top of Las Setas . We strolled the walkway under the purple and orange Sevillana sunset. The panoramic view of the city was breathtaking. 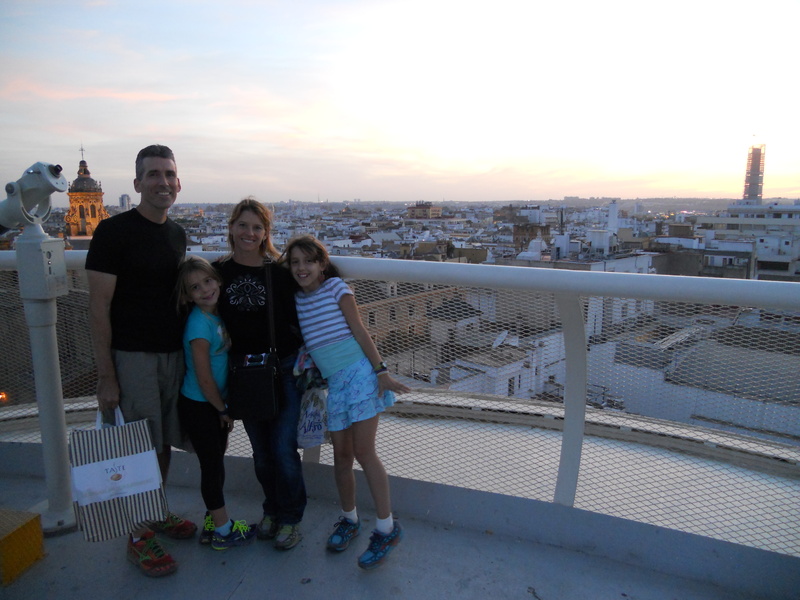 We took a deep breath of Sevilla and agreed it was a full day. We had a short break back at the hotel and then went to the home of Carolina’s family for dinner. 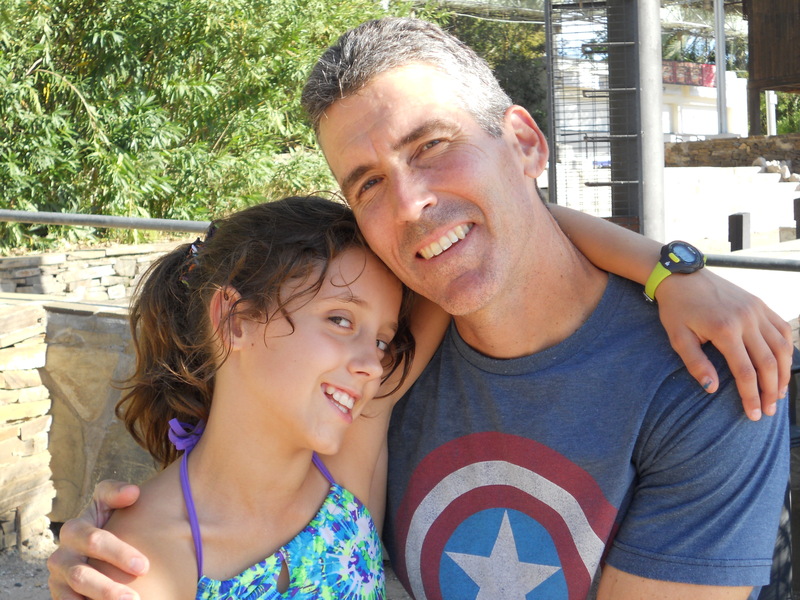 Carolina’s father, Jeff is originally from Singapore and her mother, Ana is a native Sevillana. They met at BYU in Utah where they both attended college. Her parents were kind and welcoming. They hugged and kissed us as if we were part of the family already. Sadly her elderly grandfather had died the day before and the funeral had been earlier in the day. We felt awkward coming for dinner under the circumstances but Jeff assured us that our visit was a welcome distraction. He had prepared a delicious Chinese meal. He scooped us delicious rice from his giant rice cooker. We ate tofu and vegetables and ginger chicken. It was our first Asian food in Spain and it was wonderful! 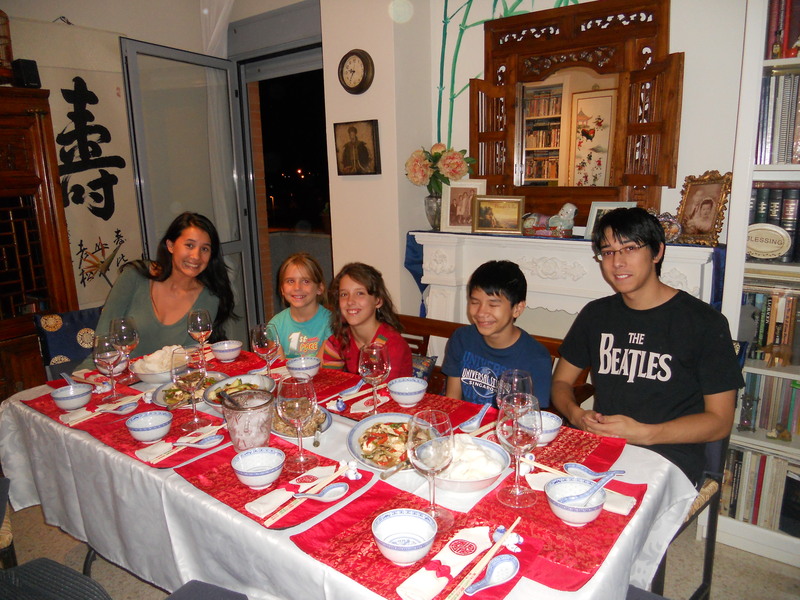 We all agreed that the dinner with the Koh family was our favorite part of the day. We slept late Sunday morning and the girls did their homework in the hotel room. 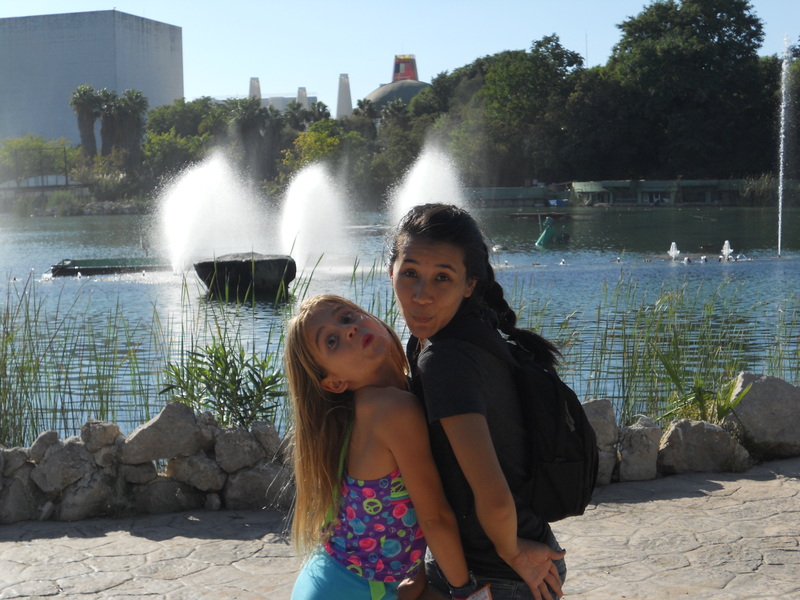 Carolina came over at noon to walk over to Isla Magica with us. 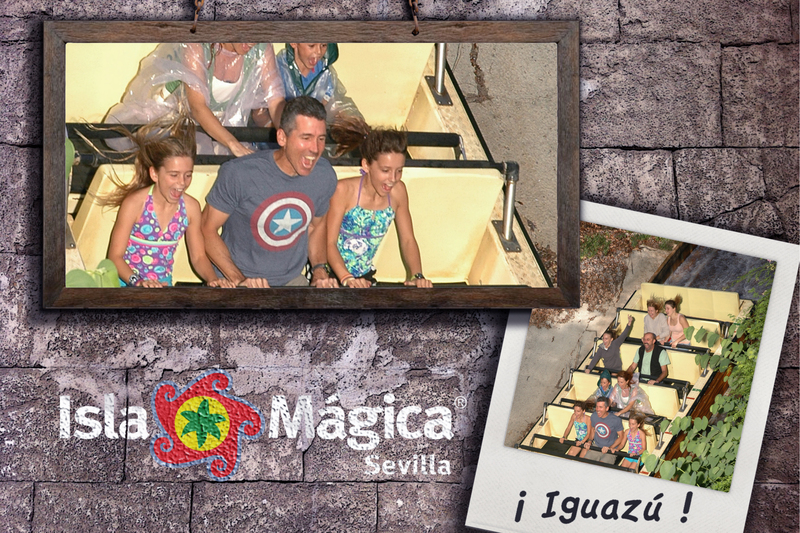 Isla Magica is Sevilla’s pirate themed amusement park. 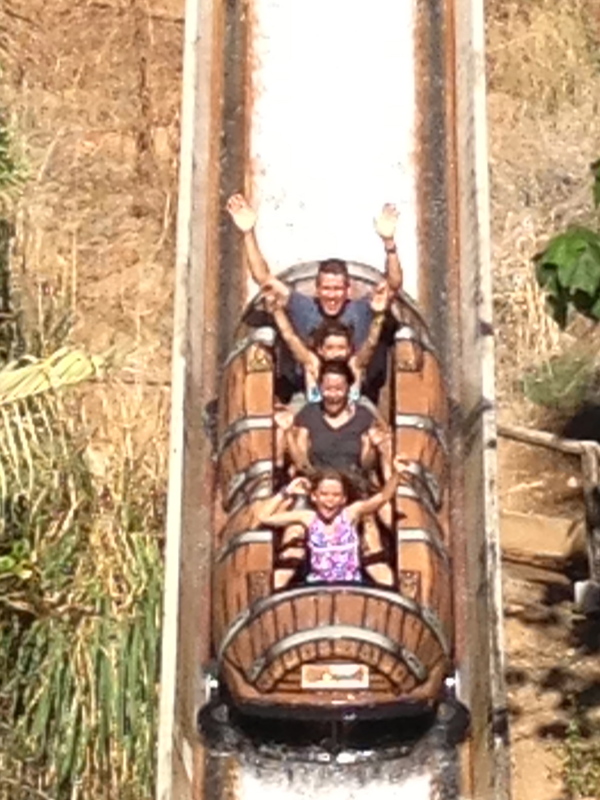 No one told us to have a magical day like at Disneyland, but it was a fun day just the same. October is the end of the season for Isla Magica so it was nearly empty. 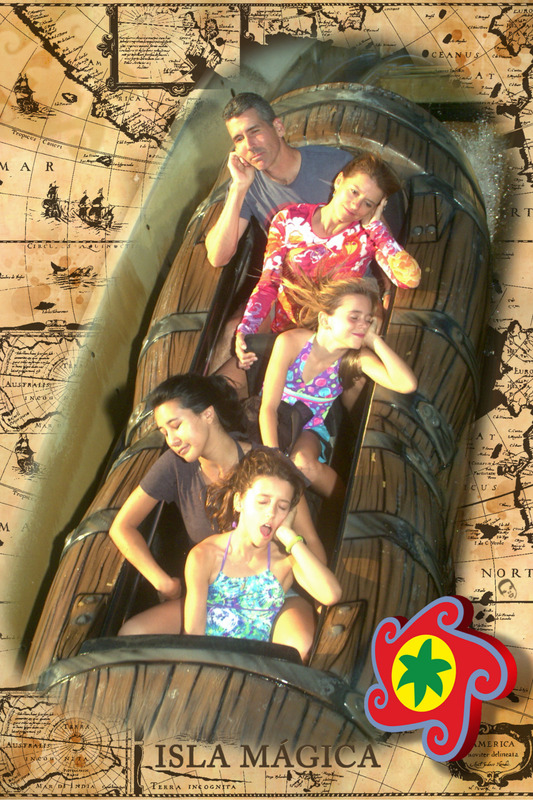 We never waited more than 10 minutes to get on a ride so the girls rode every ride, several times! 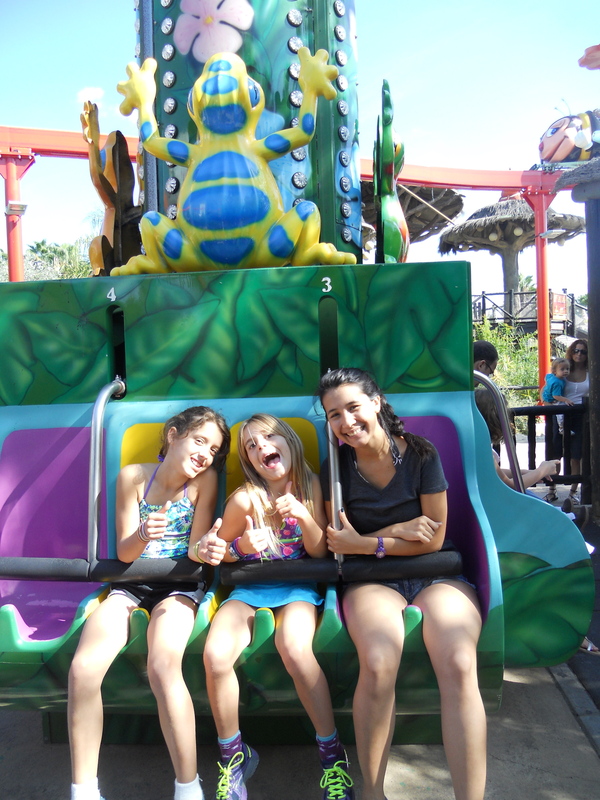 Our favorite was “La Anaconda”, a water roller coaster. 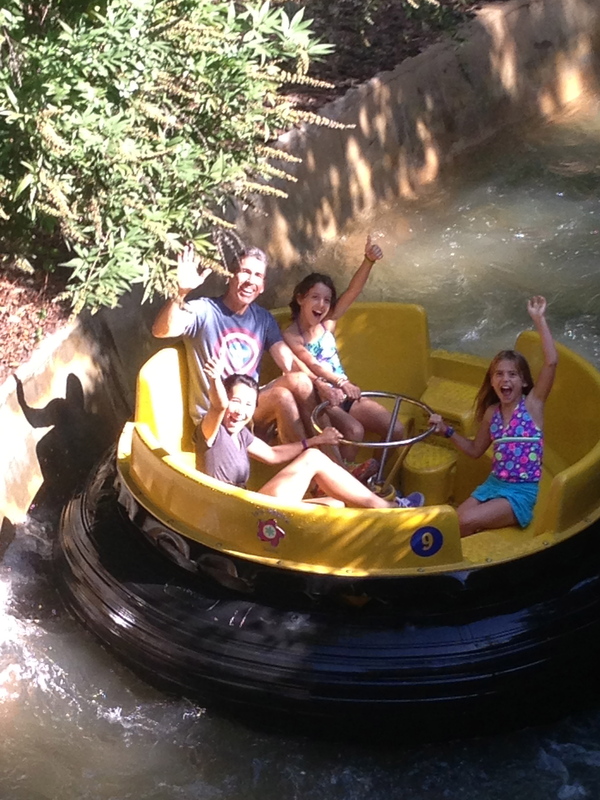 It had no line at all and we must have ridden it at least 5 times. We discovered where the camera was and planned our poses. 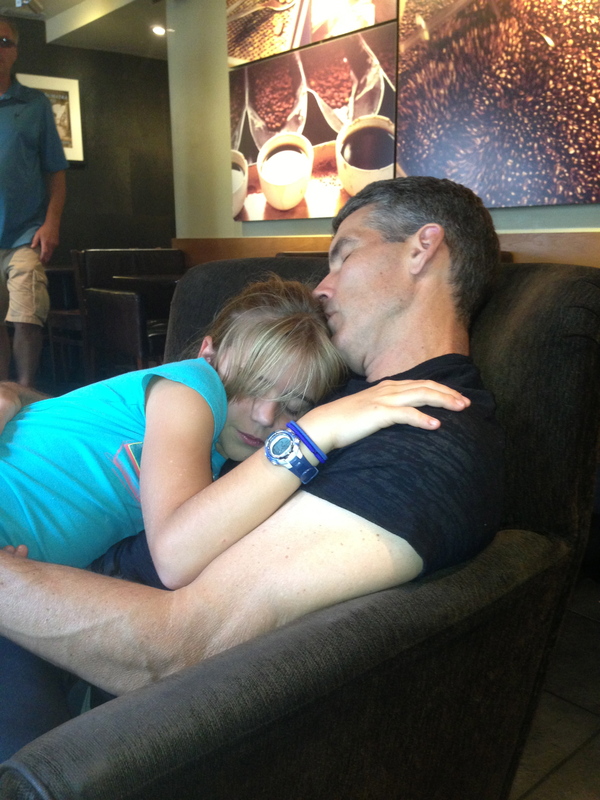 We laughed and laughed at our sleeping pose. If felt good to laugh so hard. At the gift shop Sky and Savvy choose to make a stuffed animal for their souvenirs. 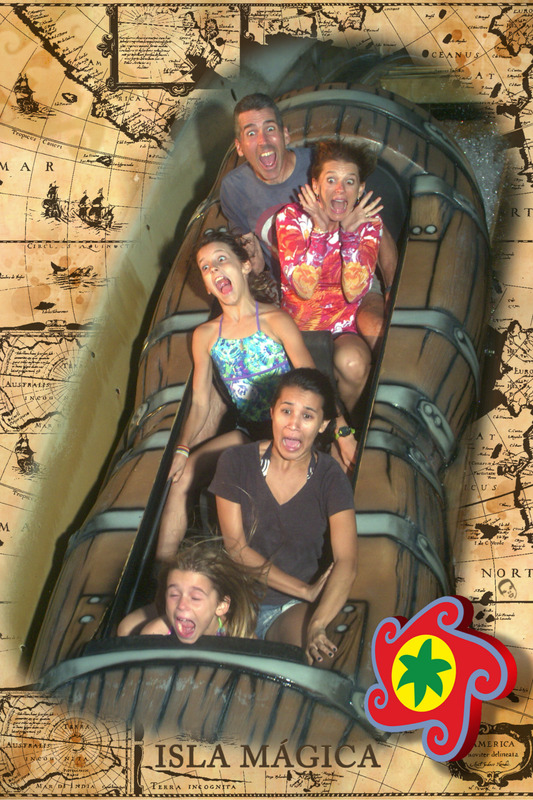 We stayed until the park closed. We drove Carolina home and got on the A92 back to Alhama in the dark. The girls slept the whole way home snuggled up to their new stuffed animals.